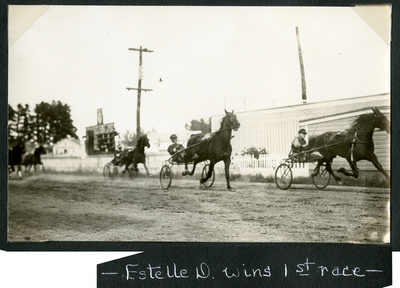 Black and white photograph of chestnut gelding Estelle D. winning the first race of the Oxford County Fair, Norway and South Paris, Maine on Saturday, July 25, 1936. Finishing in second place is San Bellini. Volunteer finished in third place. Crossing the finish line in fourth place was John Rowland.